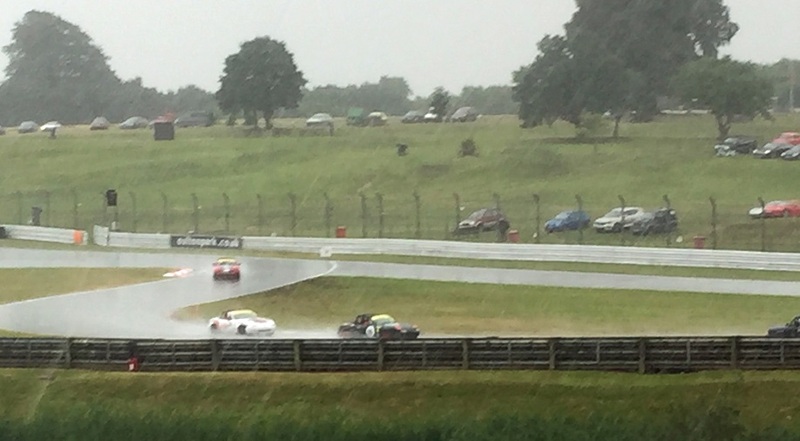 The last race in the BRSCC Mazda MX-5 Championship at Oulton Park on Saturday took place in two halves. I started in 7th on the grid, with my aim being to get on the podium; I knew I could do it. I lined up in my grid spot aiming to move forward with a good start. However, I also knew of the consequences of jumping the start; I received a 10 second time penalty in the previous race, albeit I thought it was a bit dubious! With the 5 second board up, I readied myself. My start was good, gaining positive momentum to the cars in front. I held my position rounding the first corner and started heading down to Cascades corner, only for the red flag to be waved. Without even a lap completed the race was restarted. Unfortunately, it is was my team mate, Will Hayden who was caught up in a scrap with another car, due to no fault of his own. The marshals got us all lined up before the start line to form the grid again and recover some stricken cars. Thankfully, Will was able to continue. So, I lined up again, in 7th position. With the race already shortened to 15 minutes, rather than the usual 20, it was now only 12 minutes. For me to make ground, I knew I had to do it quickly. This time my start was even better, I immediately darted to the inside to overtake Clive Chisnall. After I passed Clive, my sights were set on the car right in front, even before the first corner! I thought about going up the inside but decided against it as that may have caused a big accident. I followed the green car (722) through the first corner, and then at Cascades I made my move. I chucked it into 3rd to get a run on the straight coming into Island corner and Shell Oils Hairpin. I gained a run alongside #722 and got on the inside at Island corner. #722 tried to hold it round the outside, but ran out wide and onto the grass and spun. With the second move done and a few positions gained off the start I knew I was in business but had to keep going. With a little bit of a gap I kept pushing forward. I gained onto the back of the black and orange car. I knew I was quicker than them, all I needed was a way past. After a lap and a half following closely, I made my move round the outside at Lodge Corner onto the front straight. With the run into the first corner, the driver now behind fell back, and I shifted my sights further forward. I knew I was doing well, although I didn’t stop pushing. I could see Nick Le Doyen and Oliver Robinson ahead battling for first place. This was more than an incentive to go even further. I started closing the gap slowly with time running out. I caught up to them both. But then I started to notice a fast Marcus Bailey appear in my rear mirror. With myself behind Nick Le Doyen, Marcus gained. A couple of laps later entering into Shell Oils, Marcus had the run on me, but I also had a run on Nick in front. I went to the outside to try and get past Nick, however in doing this, I lost a position to Marcus. Going too wide down the short straight into Brittens chicane, I fell back into line and followed Marcus into the technical section. I followed Marcus through the quick left and into the snap right, with Nick close in front of Marcus. Coming out of the chicane, I saw Nick heading wide out of the corner, and then start to rotate. I moved to the inside to try look for a gap. Nick spun in front of Marcus, and I gained two positions. In all this battling Oliver Robinson had created a substantial gap out ahead. The race went into a lull for a bit with no action, just three cars, five seconds apart, Marcus 3rd, myself 2nd and Oliver 1st. Coming to the end of the race, I noticed my tyres were starting to go off, with a fair amount of understeer in vital corners. I tried adjusting my driving style to make up for it but it was too late. Marcus gained on me heading into Cascades and managed to get past me before Island bend. I knew my tyres were struggling at this point and was happy with my progress. I tried staying with Marcus but he was too quick. But… the finishing line was not far off. A second position… a podium finish was achieved. My second in my debut season! Next Post: SILVERSTONE…. WHAT HAPPENED TO THE HEATWAVE? Hi Matt. First of all my congratulations for your rapid progress in what is a seriously competitive sport. Also, I think your idea to write a Blog recounting every step of your journey is a brilliant idea. I guess some others may see it as blatant self-promotion but for my part I think you do a great job. Your writing is very honest, and from the heart. What’s more…for someone of your age it’s remarkably well-constructed, with good grammar and no typos. For someone like me, it provides an honest account of what it’s like to start racing MX5s from scratch. How you find the time to do justice to a ‘column’ like this, when you’re doubtless busy already, is beyond my comprehension! I came across your blog when looking for information related to racing MX5s, in particular thje Mk1 variant. I’m in my sixth year of racing, having started with an historic FIA MGB in 2012 at the tender age of 61! I really enjoyed learning my craft and experienced some spectacular racing, including entries at Silverstone Classic and the Spa Summer Classic. Sadly, after 4 years the budget was starting to get away from me and I chose to ‘downsize’ to something more affordable which turned out to be the BRSCC Fiesta Championship. I now run a Mk3 Fiesta Si in Class A. The car cost me a little less than yours and race fees are no doubt similar to yours (we share the same race weekends! ), but sadly its cost me a fair bit in mechanical repairs. Running costs are definitely less than the MGB but still higher than I would like. I raced in a BARC series yesterday and met a guy called Jon Halliwell who runs an MX5 race series under their banner. He assured me that Mk1 MX5s are pretty much unburstable, so running costs are really low. Do you mind me asking what is your experience? Not just you personally, but ‘the word on the street’? Barring racing accidents, how reliable are the Mk1 cars? I gather – just like my series – you’re not allowed to do very much to the manufacturer’s standard spec – is that right? I’d be keen to know what might be the implications in shifting back to a rear drive car like yours? I’m at Castle Combe this weekend, like you I’m sure, so I’ll come find you sometime and introduce myself. Sadly, for me the Friday will be spent paying Pete Daniels to replace my gearbox at the circuit! Many thanks for your comment & praise, its much appreciated! Yes well, it was really an idea my Dad came up with but I’m very much behind it, I think its good to just get yourself out there even thought it’s only talking about myself. I have my GCSE English teacher to thank for how I write! Only got a C but he instilled the style. It is difficult to find the time I will be honest, but its got to be done, not only for myself but for my sponsors too. Oh cool well that’s good to hear my blog came up amongst all the other stuff! Wow now that’s old school (apologies I was only born in 1996). I bet driving those was a real challenge, I certainly think I’d struggle! Within AB Motorsport we’ve actually got a driver who’s of similar age to yourself, Paul Bateman, and he still pedals, and very well indeed! I visited Spa last year in my Dads MK3 MX-5, fantastic track, loved it. Ah of course the Fiestas, they always look pretty rapid if I’m honest, also prone rolling over I’ve heard! But they look & sound good. So my experience with the MX-5s so far, is really only good experience. In terms of driver standards & such like that, I think that on the most part its pretty good. They are some occasions where the odd mistake happens (I myself have been guilty of this before, having visited the Clerk of Course at Cadwell Park). But only the 2 times it has happened, I’ve gone straight to the driver & apologised, & they’ve been understanding. When it comes to reliability, I think also its been pretty good. The only problems I’ve had have been because I bought a car with a knackered engine in it. This was rebuilt & now feels like a whole new car. Also minor things like a new windscreen (due to my bonnet flipping up mid testing! ), and then just other standard consumables really. Yes so in terms of power output you are quite restricted, 105bhp being the limit. Now when I say that to people, they usually say something like ‘Well that’s nowhere near enough’ but the MX-5s aren’t about that at all, more about power to weight & handling, as you can probably imagine. Unfortunately I won’t be at Castle Combe this weekend as the MX-5s don’t visit there, I’ll be all the way up at Anglesey! To be perfectly honest I’ve never driven a FWD car on track (Except for my ARDS test, that was in Peugeot 308 GTi) so I don’t necessarily know the implications, however if you have experience in RWD car, like MGB then you should be alright. With the MK1s, a certain style of driving is required, and its something I learning about every time I drive it. You have to really throw it about & not be afraid of it sliding, as that’s how you get the most of it, driving right on the limit of slip angle ( & sometimes over). So I think going from the setup on Fiesta, which I believe use semi slicks? I would imagine it would be quite a different grip level. One person that I know full well would have perfect advice from swapping from Fiesta to MX-5, is John Langridge, who I also believe won the Fiesta Championship a couple years back? He’s now racing with AB Motorsport and is going through learning experience I imagine yourself may or may not go through. But anyway, I hope that helps! Always nice to chat to another enthusiast of course!